Courage is a trait your child will need for her whole life to face challenges and obstacles that get in her way of achieving her goals. Emphasizing courage to your child when she is quite young can help her child grow up with a strong sense of courage and belief in herself. Age-appropriate activities are an excellent way to introduce you child to the concept of courage and the many ways it exists. 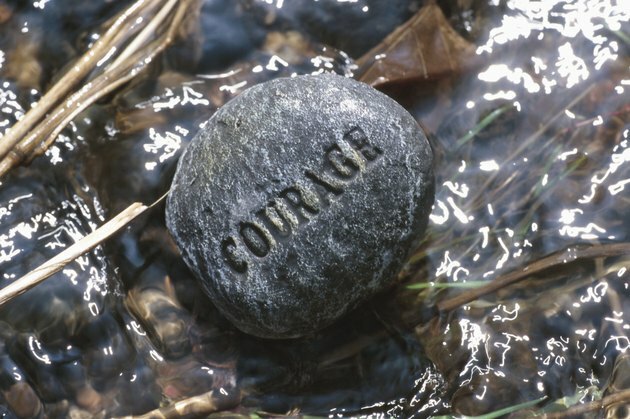 Age-appropriate books on courage can help foster an understanding of the concept. For children ages 4 and up, "Courage" by Bernard Waber teaches children about all types of courage, from a rescue firefighter to admitting when you are wrong. For kids ages 6 and up, "Spaghetti in a Hot Dog Bun: Having the Courage to Be Who You Are," by Maria Dismondy tells the story a young girl who is teased for being an individual, but still has the courage to be true to herself and be a good person. After reading the book, have a discussion with your child about courage and the ways that she shows it every day. Discuss having the courage to do the right thing with your child. Role play situations with your child where she might have to demonstrate courage. For example, you can pretend to be your child's best friend and tell her that the two of you should not be friends with her teddy bear because it doesn't look like us -- even though it is a nice teddy. Encourage your child to demonstrate courage by standing up to you and telling you that it is wrong to not be friends with the teddy bear just because it looks different than you. For another role play situation, pretend that you are bullying someone. Although it might be easier to just walk on by, encourage your child to demonstrate courage by getting a teacher (perhaps your spouse for role-play purposes) to handle the situation. Create a courage tree with your child to hang on a wall. Cut a large tree shape from brown and green craft paper and glue some mini magnets at various points on the tree. Next, cut several apple shapes out of red construction paper. Tape the tree to a wall, and have your child write characteristics of courage on the different apples, such as "trying new things," "doing what is right," and "standing up for yourself." Then glue a magnet to the back of each "apple." Your child can then add or remove courage apples each day, based on what courage traits she demonstrates that day. Encourage your child to face up to something she might fear. Perhaps the neighbors have a friendly, but rather big dog that she's afraid to pet. Maybe she is scared to try gymnastics, even though she really wants to try. Whatever the case is, as long as it is safe and healthy, help her face her fear by discussing exactly what it is that makes her fearful. Talk about how courage gives her strength to face her fears. Once she overcomes a fear she'll realize that she had nothing to fear in the first place.